This entry was posted in Scripting, The Power of Task Sequences and tagged Task Sequence, VBScript. First, I want to thank everyone who joined my SCCM Guru webcast on the Power of Task Sequences last week. There was a great audience who asked questions the entire time, which means I didn’t bore you all :-) If you were not able to watch the webcast, the replay is available on BDNA’s website. Optionally, you can grab my slide deck from MyITforum. In the future, I plan to do a series of blog posts on my content on the Power of Task Sequences. During the presentation, it was possible to ask questions. Rod Trent and Ron Crumbaker were attempting to answer as many as they could, but the following questions they could not get to at that time. Q: Is there a way to target a user or group instead of a computer to run a task sequence? Q: Within the cmd line, does SCCM do error checking to make sure the commands are correct syntax? A: No, unfortunately it does not. So you will need to use caution with what you enter and test that in advance to ensure the command is accurate. Q: What are the advantages of using multiple applications? A: The total size of the task sequence XML cannot exceed 10 MB. Should you run into a situation where there are too many steps (or whatever) that cause the task sequence to be too large, you could consolidate steps that install individual software into just the one step. Q: Is it possible to use Task Sequences with Internet Based Clients? Q: Are Collection Variables stored for future reference on each device of that collection? I mean, once I set them, if I need to use them another time, would it be accessible with its previous value? A: It depends. Any collection with a collection variable assigned to it, any computers in that collection will receive that variable and value. However, if the variable is blank/empty, such that it gets set during execution of the task sequence, the value will be reset after execution of the task sequence completes. Q: so… if I set a variable with the IE proxy, for example, once that it was set once; if I re-image the computer, the previous entered value will be accessible, right? Q: Is there a TS variable to retrieve the current user that is logged into the machine the TS is running on? Have a step in the package that grabs that custom registry key, and optionally stuff it into a custom variable for other uses throughout the task sequence. Q: RE: some updates not running during TS… would a restart and repeat of the Install SW Updates step do the same thing as the rescan script you mentioned? A: Ultimately, it would be nice if we didn’t have to do any of the additional steps. This is longstanding known problem that is unfortunately resolved by running the script (which just forces a scan for the latest applicable updates) and then the Install Software Updates step which actually initiates an install of those “new” updates. Q: If a step inside the sequence fails, how do you get the CM report to show the failed step? A: The task sequence will automatically report the status failures up to the site for reporting, so there is no need to do anything special. Q: Is it possible to call other task sequences from within a single “master” task sequence? A: This is the question of the day! Ironically, I was curious about the same thing when creating this presentation. I wanted to call it the “Inception” effect, just like the movie. Unfortunately due to time, I wasn’t ever able to develop/test to see if it was possible. Maybe I will do that for a future blog post!! Q: Is that sup_fix.vbs out on myITforum somewhere? Q: What’s red and smells like green paint? Q: Would the task sequence continue after reboot if no one logged on? A: Yes, it will continue until completion. Q: In order to use the TSs without installing the OS; you need to create a custom one and do not select a Boot Image, right? Q: you showed how you can determine if an application is installed by WMI query add/remove programs. 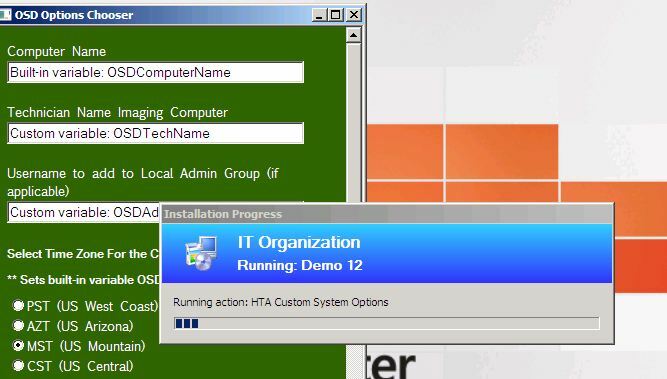 Is there a way to query if a particular program was successfully installed via a SCCM advertisement in a task sequence? Q: How do you deal with network share permissions when running setup from shares? What rights are needed? Q: How do you assign a task to a collection? Q: What is the limitation to how many TS actions and\or TS Groups that can be in a task sequence? Q: Where do you define what boot image it will boot to? Q: The installed software condition in the TS, can that be used to re-installed non- standard software in an XP to 7 refresh? A: The question I ask is what defines non-standard software? If that means the software isn’t packaged in SCCM, then no SCCM can’t do reinstall the software. Otherwise if it is packaged, then you would need to write custom scripts to detect for the software and write true/false into custom variables for later use in the task sequence. Or use MDT 2010 with UDI or some other similar solutions. Q: can a task sequence be customized to change the language of the OS install? Q: I ask because we currently are using images for x86 and x64 plus x86 and x64 in Spanish. Can a task sequence be setup to install the os language of choice? Q: Is the script for the install software updates fix available for download somewhere? Q: Can you guy please email or upload somewhere xml for the TS Demo 12 as well as Custom HTA??? Q: Any good resources on developing .hta files for TS? That is something I’ve wanted to do be haven’t had time to research. Q: Will all the demo scripts be available? A: I plan to do a series of blog posts on all the content from this presentation, so feel free to sign up on my blog to receive email updates. Q: What’s the best variable to use when setting the machine name of a computer when reimaging a computer that exists in the ConfigMgr console already (OSDComputerName or another one)? I always have issues where one or the other always contains the old name. Q: Question. Do you have any experience trying to install an OS with no touch installation? I mean boot to PXE, press F12 and not having to do anything else to start the TS. This is really valuable when installing an OS on multiple PCs. Thanks. A: I do not have personal experience doing it in production. The question becomes how you are going to assign a computer name or any one-off applications. If you just wanted the PC to retain the generic name of MININT-RandomString, then this will work easily by making the advertisement mandatory with a deadline in the past. Otherwise, you would need to either manually import the computer with its MAC address into SCCM along with the name you want it to have (which is FAR more work and is a pain). Or you would need to have a script that would query a script to retrieve a computer name from a spreadsheet or something. It is possible, but I prefer the quick and easy approach which is a 10 second entry of a computer name that then sets OSDComputerName. Q: Could you explain why one would do multiple apps this way, rather than run each app as separate steps? Q: Can you share the Office template? This entry was posted in The Power of Task Sequences.